George Pass, born in Newport Pagnell (his father was a coach body maker), trained to be a teacher in Winchester and then joined the Boys’ School in Winslow in 1890. After becoming its Headmaster, George Pass was promoted in December 1901, to be the Head of the new mixed National School being built in Sheep Street by Messrs Tombs & Son of Buckingham in anticipation of the opening of that school with about 190 pupils by the Bishop of Reading during January 1902. The staffing structure included a certificated male assistant teacher, a job awarded to Mr Attwoollwho had trained at Exeter Training College, and three female assistants: Miss Kate Ray (a native of Winslow who married another teacher, William Young, in 1907), Miss Attwooll, the sister of Mr Attwooll with three years teaching experience in Lyme Regis and a third post (worth £40 a year) remaining to be filled. George Pass was an advocate of “tough love”. He was a strict disciplinarian but he gained the affection of generations of pupils because of his care for them. That care didn’t end when pupils left school but continued through their lives, particularly when his lads were serving their country in its forces. 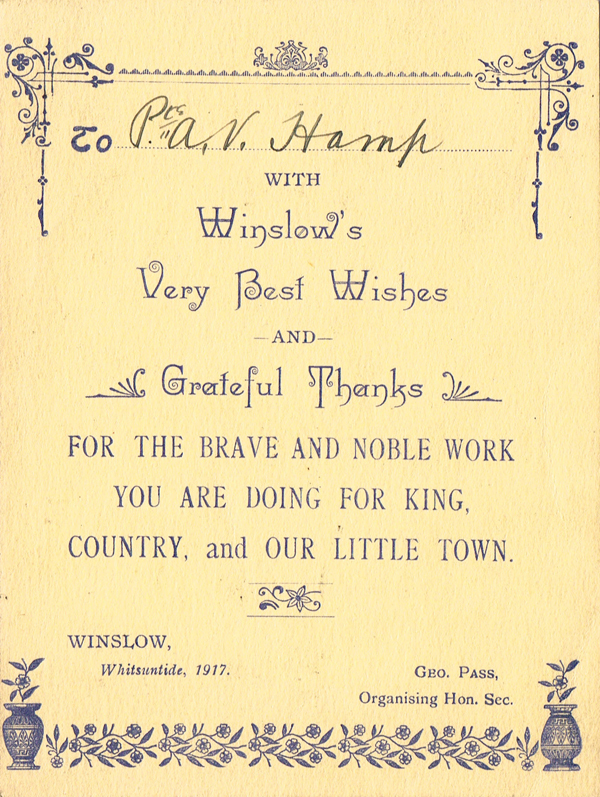 At the outset of World War 1, George Pass was co-opted onto the Winslow Distress Committee that helped to repatriate a German woman and found homes for Belgian refugees. He was at the centre of activities to support “our lads”. For instance, in November 1915 he was the organiser of a concert held in the Oddfellows’ Hall to raise money to send Christmas boxes to soldiers and sailors from Winslow. At Whitsun 1917 gifts were sent out (see image on right). George Pass and the Vicar of Winslow had engaged the 180 strong force of “Norfolks” (Norfolk National Reserves, also stationed at Bletchley to protect essential installations), who had been stationed at Winslow since autumn 1914, both in activities around Winslow and in raising funds for the soldiers and sailors. When the company left town suddenly in March 1916, their commanding officer, Captain Hansell said, “they had received the greatest of kindness from all, and they should always look back with pleasure to their stay in this pretty little spot, which he intended to re-visit when he had the opportunity.” He then thanked the Vicar and Mr Pass (Bucks Herald, 25 March 1916). George Pass retired at Christmas 1925 from his headship. He was given many gifts at a fond farewell in the St Laurence Room. These came from local people, former pupils and their parents, and from ex-military men who recalled his unstinting support during World War 1. One parent eulogised Mr Pass for the standard of conduct he had instilled in his pupils. George Pass’s fund-raising activities carried on through his retirement. In 1930, his Winslow “Flag Day” collection for the centenary of the Royal Bucks Hospital raised over £20. In World War 2, he collected pennies for Red Cross Funds and he was honoured in 1942 for having raised £61 5s 5d in “Winslow Town”. In his earlier days, George Pass had been a keen sportsman. 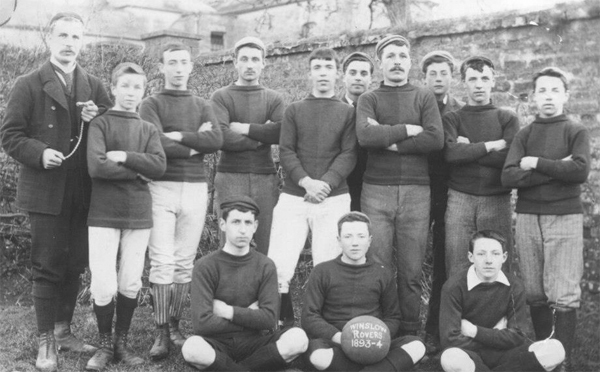 He ran the Winslow Junior Rovers team (he is on the left in the photo below, 1893-4 season) and was a founder member of Winslow United Football Club, described by the Bucks Herald as "that most democratic of bodies which included in its original team two clergymen, a rat-catcher, two doctors, a solicitor’s clerk, a carpenter, a painter, a builder and George Pass, headmaster!" George Pass's first wife, Jane Elizabeth, died in 1899 aged 36. As a widower he lodged with the vet John Varney at 162 High Street. He then married (in 1904) Ruth Hurlstone, widow of the Winslow ironmonger H.A. Hurlstone. They had a 3-year-old son, Frank Noel Pass, recorded in the 1911 Census. They lived at “The Maples”, Buckingham Road. Ruth Pass died on 5 April 1949 aged 80, and George Pass died on 29 May 1951.